Inflammation is a prominent feature of ischemia-reperfusion injury (IRI), which is characterized by leukocyte infiltration and renal tubular injury. However, signals that initiate these events remain poorly understood. We examined the role of the nuclear alarmin IL-33 in tissue injury and innate immune response triggered by experimental kidney ischemia-reperfusion. In wild-type mice, we found that IL-33 was constitutively expressed throughout the kidney in peritubular and periglomerular spaces, mainly by microvascular endothelial cells, from which it was released immediately during IRI. 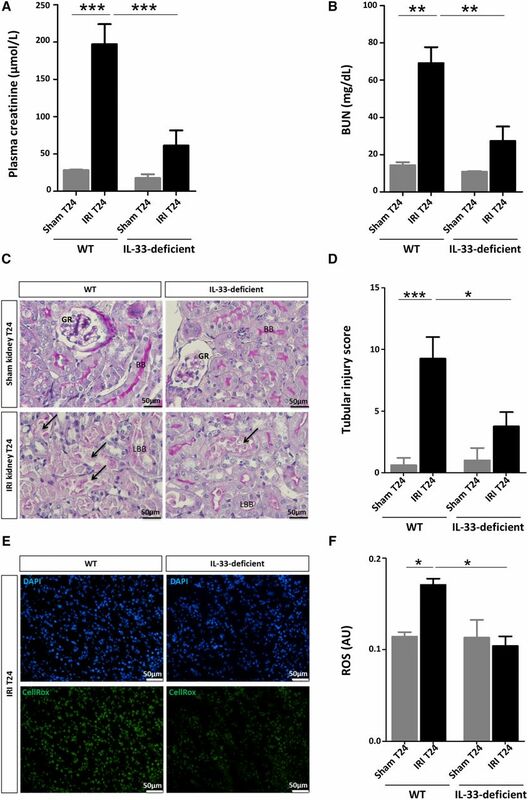 Compared with wild-type mice, mice lacking IL-33 (IL-33Gt/Gt) exhibited reductions in early tubular cell injury and subsequent renal infiltration of IFN-γ/IL-17A–producing neutrophils, with preservation of renal functions. This protection associated with decreased renal recruitment of myeloid dendritic cells, natural killer (NK) cells, and invariant natural killer T (iNKT) cells, the latter of which were reported as deleterious in IRI. 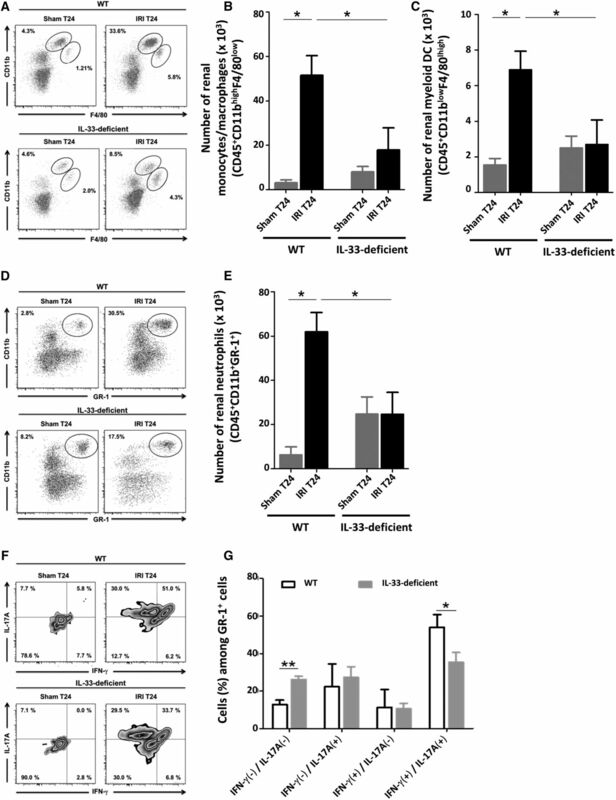 Increases in the level of circulating IL-12, a key IL-33 cofactor, and the expression of ST2, an IL-33–specific receptor, on the surface of iNKT cells preceded the IL-33– and iNKT cell–dependent phase of neutrophil infiltration. Furthermore, IL-33 directly targeted iNKT cells in vitro, inducing IFN-γ and IL-17A production. We propose that endogenous IL-33 is released as an alarmin and contributes to kidney IRI by promoting iNKT cell recruitment and cytokine production, resulting in neutrophil infiltration and activation at the injury site. Our findings show a novel molecular mediator contributing to innate immune cell recruitment induced by renal ischemia-reperfusion and may provide therapeutic insights into AKI associated with renal transplantation. 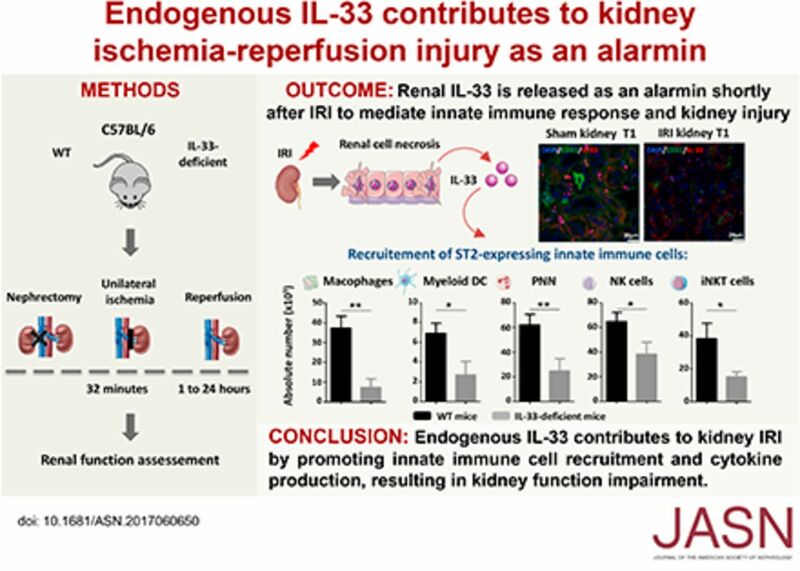 IL-33 has been described as a potent inflammatory mediator with deleterious effects in nephrotoxic and obstructive AKI.21,23 However, in the two models, early alarmin-like release of IL-33 has not been documented, because IL-33 is apparently synthetized within 2–4 days after AKI induction, like a conventional cytokine. However, the protective effects of exogenous IL-33 through activation of ST2-expressing counter-regulatory immune cells, such as type 2 innate lymphoid cells24 and Treg,25 have been documented in some experimental AKI settings. In humans, IL-33 has been implicated in CKDs.26,27 Regarding renal transplantation, our recent findings suggest that, during kidney IRI, IL-33 acts as an alarmin promptly released into serum and urine after reperfusion.28 In this clinical situation, IL-33 levels and IRI duration are correlated, supporting a close connection between kidney cell injury and IL-33 release.28 Nonetheless, direct proof of the involvement of IL-33 in experimental kidney IRI has not been provided so far. We first examined the expression of IL-33 and its localization in healthy kidneys from wild-type (WT) mice. IL-33 was clearly detected in periglomerular and peritubular areas by immunohistochemistry (Figure 1, A and B) in accordance with observations by Akcay et al.21 The specificity of the immunostaining was validated by the absence of immunoreaction in kidneys from IL-33–deficient mice. IL-33 was constitutively expressed in both peritubular and periglomerular cells, predominantly in nuclei (Figure 1C). No immunofluorescence was detected in IL-33–deficient mice (Supplemental Figure 1). Costaining of IL-33 and CD31, a highly specific endothelial cell marker, revealed a majority (approximately 60%–70%) of interstitial cells coexpressing both molecules (Figure 1C). The 20%–30% CD31(−) IL-33(+) cells were not resident immune cells as assessed by costaining with the common leukocyte marker CD45. Indeed, CD45-bright cells identified as leukocytes did not express IL-33 (Figure 1D). IL-33 is constitutively and predominantly expressed by capillary endothelial cells in peritubular and periglomerular areas. (A and B) Immunohistochemistry for renal IL-33. (A) Representative illustrations of IL-33 staining in WT mice (left panel) and IL-33Gt/Gt mice used as negative controls for IL-33 staining (right panel). (B) Quantification of IL-33 staining (five animals per group). Two-tailed Mann–Whitney U test. ***P<0.001. (C and D) Immunofluorescence staining for IL-33 (red), CD31 (green), CD45 (gray), and 4,6-diamidino-2-phenylindole (DAPI; blue) in WT mouse kidneys. (C) Costaining for IL-33 (red), CD31 (green), and DAPI (blue) showed nuclear expression of IL-33 by capillary endothelial [CD31(+)] cells in peritubular and periglomerular spaces of the outer medulla. The same IL-33 expression profile was found in the cortex (not shown). (D) Costaining for IL-33 (red), CD31 (green), CD45 (gray), and DAPI (blue) revealed three cell populations among IL-33–expressing cells: CD31(+) CD45(−) cells, which constitute the large majority (60%–70%); CD45(−) CD31(−) cells (20%–30%), which presumably represent fibroblasts and/or pericytes; and CD31(+) CD45 (at intermediate levels) cells, which presumably represent endothelial precursor cells (10%–20%). GR, glomerular. Tissue injury after kidney ischemia-reperfusion is initiated by acute reduction of blood flow leading to endothelial cell necrosis. We surmised that IL-33 might be released from necrotic endothelial cells soon after ischemia-reperfusion. To test this assumption, we induced IRI in WT C57BL/6 mice by unilateral clamping of the renal pedicle for 32 minutes after contralateral nephrectomy as schematized in Supplemental Figure 2. IL-33 immunofluorescence staining was clearly diminished in both periglomerular and peritubular endothelial [CD31(+)] cells (Figure 2A, right panel) as soon as 1 hour after reperfusion of the injured kidneys compared with their healthy contralateral counterparts (Figure 2A, left panel) used as internal steady-state controls. Consistent with alarmin release, intracellular IL-33 was not decreased in sham-operated (Sham) mice (Figure 2A, center panel) without clamping. This partial early loss of IL-33 from ischemic kidney was confirmed by Western blot analysis (Figure 2B). It was concomitant with a rise of circulating IL-33, which was virtually undetectable before IRI (T0) but increased in plasma 1 hour after clamping. A partial and transient but smaller increase took place in Sham mice (Figure 2C) at this time point due to the incision alone. Elevated plasma IL-33 levels persisted for up to 6 hours and returned to baseline within 24 hours of reperfusion (Figure 2C). Release of IL-33 1 hour postreperfusion did not require transcription as attested by quantitative RT-PCR analysis, which revealed no difference in Il-33 gene expression between control (1.0±0.035, mean±SEM; n=7) and 1-hour postischemic (0.95±0.08, mean±SEM; n=5; P=0.67, t test) kidneys. These data support a release of endogenous protein rather than de novo synthesis soon after injury in accordance with the notion that IL-33 acts as an alarmin in ischemic mice. IL-33 is released early after IRI. WT and IL-33Gt/Gt (IL-33–deficient) mice were subjected to sham surgery (Sham) or 32 minutes of unilateral ischemia (IRI) after contralateral nephrectomy (Ctr). After 1, 3, 6, or 24 hours (T1, T3, T6, or T24, respectively) of reperfusion, kidneys and peripheral blood were removed. (A) Immunostaining for IL-33 (red), CD31 (green), and 4,6-diamidino-2-phenylindole DAPI (blue) in healthy Ctr and Sham kidneys from WT mice showed nuclear localization of IL-33 by microvascular endothelial cells in peritubular and periglomerular renal spaces. One hour post-IRI, IL-33 disappeared from peritubular and periglomerular spaces. Healthy kidneys from IL-33Gt/Gt mice were used as negative controls for IL-33 staining (Supplemental Figure 1). One representative separate experiment of five is shown. GR, glomerular. (B) Western blot analysis in whole-kidney extracts showed a significant decrease of full-length (32- to 34-kD) IL-33 1 hour after IRI compared with healthy Ctr and Sham kidneys. (Upper panel) Representative IL-33 immunoblot (glyceraldehyde-3-phosphate dehydrogenase [GAPDH] serves as a loading control) of at least three independent experiments. (Lower panel) Quantification (relative to GAPDH) of IL-33 protein (five animals per group). (C) Plasma levels of IL-33 (picograms per milliliter) were significantly increased after IRI as soon as 1 hour after reperfusion compared with untreated (T0) and Sham mice (five to eight animals per group). Note that plasma levels of IL-33 from IL-33Gt/Gt mice were virtually undetectable (<5 pg/ml) before and after IRI. One-way ANOVA followed by Tukey post-test for three or more group comparisons was used. *P<0.05; **P<0.01. We assessed the effect of IL-33 on kidney functions by measuring blood creatinine (Figure 3A) and BUN (Figure 3B) in WT and IL-33–deficient mice 24 hours after clamping. No renal dysfunction was revealed by these criteria in mice lacking IL--33 relative to their Sham counterparts. This result was confirmed by their 100% survival rate within the first 3–4 days after surgery, contrasting with 50% survival in WT mice as a result of severe renal insufficiency (Supplemental Figure 3). ATN assessed by loss of brush border, cast formation, tubular dilation, and inflammatory infiltrates at the corticomedullary junction was reduced in IL-33–deficient kidneys versus their WT counterparts (Figure 3C), resulting in significantly lower ATN scores (Figure 3D). Kidneys from mice deficient for ST2 displayed a similarly moderate ATN score (Supplemental Figure 4), which proves that IL-33 induces kidney IRI via its specific ST2 receptor. IL-33–deficient mice are protected against IRI. WT and IL-33Gt/Gt (IL-33–deficient) mice were subjected to sham surgery (Sham) or 32 minutes of unilateral ischemia (IRI) after contralateral nephrectomy (Ctr). After 24 hours (T24) of reperfusion, kidneys and peripheral blood were obtained (five to eight animals per group). 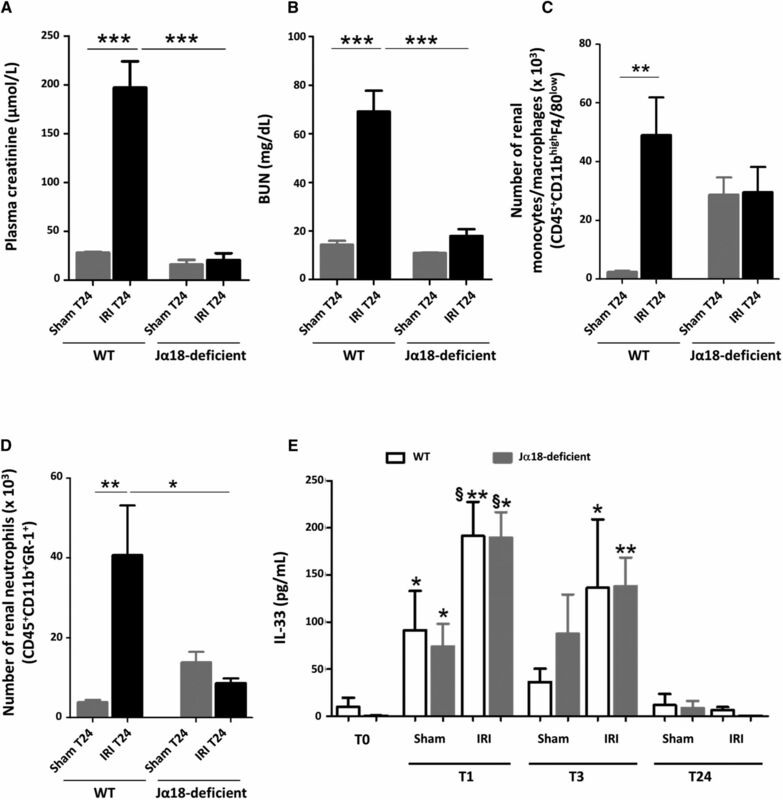 (A–D) AKI changes are attenuated in IL-33–deficient mice. IL-33–deficient mice exhibited decreased (A) blood creatinine and(B) BUN levels. (C and D) Tubulointerstitial damage was attenuated in IL-33–deficient mice compared with WT mice. (C) Representative tissue samples for tubular injury assessed with periodic acid–Schiff staining. Sham-operated WT and IL-33–deficient mice exhibited normal tubular structure with intact brush borders (BBs). After IRI, kidneys from WT mice displayed extensive tubular necrosis and loss of brush border (LBB). Arrows indicate extensive tubular necrosis and cast formation. These changes were markedly reduced in IL-33–deficient mice. Arrows indicate ATN. GR, glomerular. (D) Tubular injury scores (five to eight mice per group). Two-tailed Mann–Whitney U test was used for two group comparisons, and one-way ANOVA followed by Tukey post-test was used for three or more group comparisons. *P<0.05; **P<0.01; ***P<0.001. (E and F) IRI-induced oxidative stress generation is attenuated in IL-33–deficient mice. ROS production in renal tissue from WT and IL-33–deficient mice was measured using the fluorogenic probe called CellROX Green Reagent. (E) Images are representative of three animals for each group. CellROX Green Reagent was weakly fluorescent in Sham kidneys (not shown) and exhibited green fluorescence T24 post-IRI in WT mice but not in IL-33–deficient mice. (F) Quantification of CellROX fluorescence intensity (three animals per group). Two-tailed Mann–Whitney U test was used for two group comparisons, and one-way ANOVA followed by Tukey post-test was used for three or more group comparisons. Note that we found no difference between Sham and Ctr values (data not shown), indicating the absence of a significant Sham effect for all of the tested parameters. AU, arbitrary unit. *P<0.05. After ischemia-reperfusion, neutrophils, monocytes/macrophages, and myeloid dendritic cells (DCs) are recruited to the kidney, where they mediate IRI.6 We assessed the contribution of IL-33 to this process by comparing the incidence of total renal leukocytes, identified as CD45(+) cells, in WT and IL-33–deficient mice 24 hours post-IRI (the gating strategy is in Supplemental Figure 6A). Total CD45(+) cell counts were significantly higher in kidneys undergoing IRI in WT mice than in untreated and Sham mice (Supplemental Figure 6B), indicating a marked infiltration. Notably, CD45(+) cell recruitment was reduced at least twice in mice lacking IL-33. Additional examination of these cells showed that monocyte/macrophage (CD11bhigh F4/80low) (Figure 4, A and B), myeloid DC (CD11blow F4/80high) (Figure 4, A and C), and neutrophil (GR-1high CD11bhigh) (Figure 4, D and E) counts were all diminished, reflecting less myeloid trafficking. Kidney infiltration of inflammatory myeloid cells after IRI is attenuated in IL-33–deficient mice. WT and IL-33Gt/Gt (IL-33–deficient) mice were subjected to sham surgery (Sham) or 32 minutes of unilateral ischemia (IRI) after contralateral nephrectomy (Ctr). After 24 hours (T24), kidneys were obtained, and leukocytes were freshly isolated to examine the percentages and numbers of (A and B) CD11bhigh F4/80low cells (monocytes/macrophages), (A and C) CD11blow F4/80high cells (myeloid DCs), and (D and E) CD11bhigh GR-1high cells (neutrophils) and (F and G) the frequency of IFN-γ and/or IL-17A–producing GR-1high cells (neutrophils) by flow cytometry. Representative dot plots are shown for (A) CD11bhigh F4/80low cells, (A) CD11blow F4/80high cells, and (C) CD11bhigh GR-1high cells after gating on live CD45(+) cells. (F) Density plots are shown for GR-1high cells producing IFN-γ and/or IL-17A after gating on live CD45(+) cells. Absolute numbers (per kidney) of (B) CD45(+) CD11bhigh F4/80low cells, (C) CD11blow F4/80high cells, and (E) CD45(+) CD11bhigh GR-1high cells and (G) frequency of IFN-γ and IL-17A–expressing CD45(+) GR-1high (three animals for each group). Note that, other than single IFN-γ or IL-17A–expressing neutrophils, we identified a more representative subset of neutrophils that produce both IFN-γ and IL-17A in response to IRI. This subset, which may represent the most potent effector of IRI among neutrophils, was decreased in IL-33–deficient mice in the same experimental setting. (A, D, and F) Numbers represent the frequency of cells within the indicated quadrant. (B, C, E, and G) Data are expressed as means±SEM (five to eight animals per group). Two-tailed Mann–Whitney U test was used for two group comparisons, and one-way ANOVA followed by Tukey post-test was used for three or more group comparisons. *P<0.05; **P<0.01. Previous studies have shown the potential role of IFN-γ– and IL-17A–producing neutrophils in acute renal IRI.31,32 We analyzed the expression of these two cytokines using intracellular flow cytometry in neutrophils from WT and IL-33–deficient kidneys 24 hours post-IRI. As shown in Figure 4, F and G, most infiltrating neutrophils coexpressed IFN-γ and IL-17A in WT kidneys, whereas this subset was clearly diminished in IL-33–deficient mice. The frequency of IFN-γ(−)/IL-17A(−) neutrophils was accordingly increased in kidneys from IL-33–deficient mice versus WT counterparts. Ischemia-reperfusion–induced activation and recruitment of iNKT cells to the kidney are considered critical for neutrophil infiltration and proinflammatory cytokine production before kidney injury.6 Knowing that IL-33 drives iNKT cell activation and recruitment to inflammatory tissues,37 we examined how its deficiency affected this subset 24 hours after IRI induction. As previously reported,31,32 iNKT cells [PBS57-loaded CD1d TT(+) CD3(+)] (the gating strategy is in Supplemental Figure 7) were markedly increased in WT kidneys post-IRI compared with untreated and Sham controls in terms of both cell counts (Figure 5A) and frequency (Figure 5B). Moreover, their CD69 cell surface expression was upregulated (Supplemental Figure 8), reflecting their activation by IRI. In the same conditions, neither increase occurred in mice deficient in IL-33, which established its critical role in IRI-induced iNKT cell trafficking. 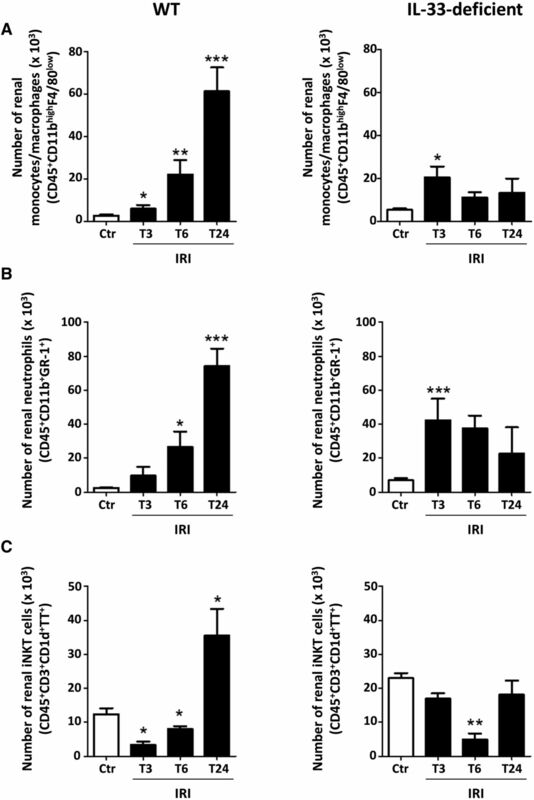 As shown in Supplemental Figure 9, plasma levels of IP-10/CXCL10, MIG/CXCL9, and RANTES/CCL5, three chemokines well recognized for their capacity to recruit iNKT cells at the sites of inflammation,38,39 were increased within 3 hours after IRI induction, but this occurred in a similar manner in WT and IL-33–deficient mice, a finding suggesting that these chemokines do not depend on IL-33 for their production during IRI. iNKT cell recruitment and function are impaired after IRI in IL-33–deficient mice. WT and IL-33Gt/Gt (IL-33–deficient) mice were subjected to sham surgery (Sham) or 32 minutes of unilateral IRI after contralateral nephrectomy (Ctr). After 24 hours (T24), kidneys were obtained, and leukocytes were freshly isolated to examine (A and B) the percentage and number (per kidney) of total and (C and F) the frequency of IFN-γ and/or IL-17A–expressing PBS57-loaded CD1d TT(+) CD3(+) (iNKT) cells by flow cytometry analysis. (A) Representative dot plots are shown for PBS57-loaded CD1d TT(+) CD3(+) cells after gating on live CD45(+) cells. Numbers indicate the percentage of iNKT cells defined as PBS57-loaded CD1d TT(+) cells with intermediate CD3 expression among total leukocytes after gating on live CD45(+) cells (the gating strategy is in Supplemental Figure 7). (B) Absolute number of CD45(+) PBS57-loaded CD1d TT(+) CD3(+) cells (five to eight animals for each group). (C) Representative density plots are shown for PBS57-loaded CD1d TT(+) CD3(+) cells producing IFN-γ and/or IL-17A after gating on live CD45(+) cells. Numbers represent the frequency of cells within the indicated quadrant. (D) Percentages of INF-γ and/or IL-17A–expressing PBS57-loaded CD1d TT(+) CD3(+) cells (three animals for each column). (E and F) Mean fluorescence intensities (MFIs) of (E) IFN-γ and (F) IL-17A were analyzed among CD45(+) cells after gating on IFN-γ and IL-17A–expressing PBS57-loaded CD1d TT(+) CD3(+) cells, respectively (three animals for each group). Data are expressed as means±SEM. Two-tailed Mann–Whitney U test was used for two group comparisons, and one-way ANOVA followed by Tukey post-test was used for three or more group comparisons. *P<0.05. It has been proposed that, during IRI, activated iNKT cells promote recruitment and IFN-γ production by neutrophils through the IFN-γ and IL-17A that they generate. Consistent with a potential role of endogenous IL-33 in this process, the frequency of IFN-γ(+)/IL-17A(+) T cells tended to decrease in IL-33–deficient mice (Figure 5, C and D), whereas IFN-γ/IL-17A expression level in iNKT cells was significantly reduced (Figure 5, E and F). This corroborates our finding that IL-33 targets iNKT cells to induce both IFN-γ29,30 and IL-17A production in vitro (Figure 6). IL-33 directly interacts with iNKT cells to induce increase in IFN-γ and IL-17A production on TCR engagement. Freshly sorted splenic iNKT [α-GC–loaded CD1d TT(+) CD5(+)] cells (details are in ref. 29) from WT C57BL/6 mice were cultured for 48 hours on plates (25×103 per well) coated with or without anti-CD3 mAb and in the presence (hatched columns) or absence (white columns) of IL-33 (10 ng/ml). IFN-γ and IL-17A concentrations in the supernatants were quantified by ELISA. Two-tailed Mann–Whitney U test was used for two group comparisons. Data represent the mean±SEM of three independent experiments. ***P<0.001. 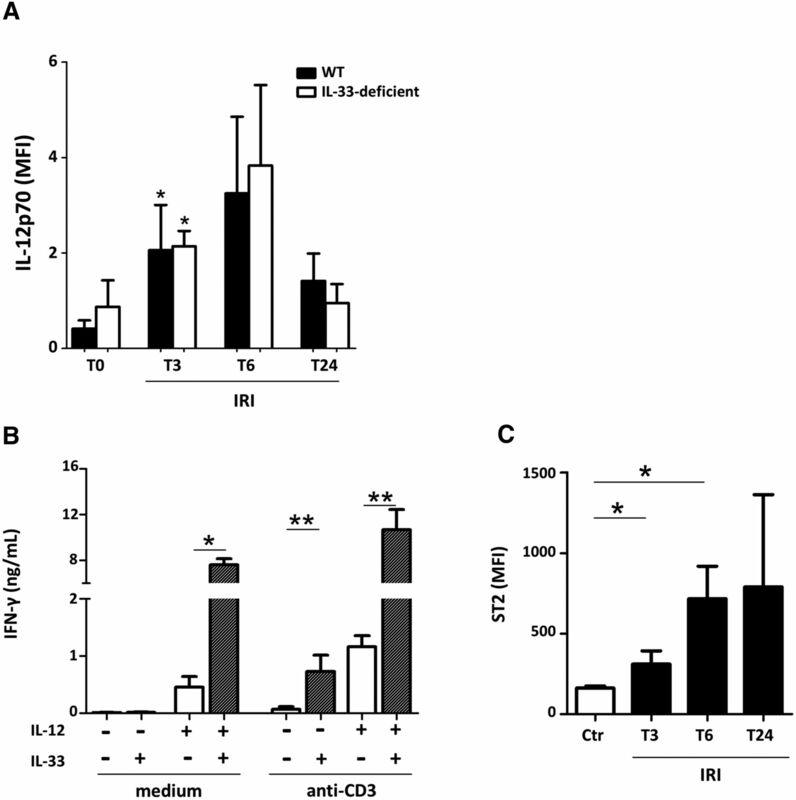 Like iNKT cells, natural killer cells, which are also known to be targeted by IL-3329,30 and recruited during IRI,40 displayed increased recruitment and IFN-γ/IL-17 expression in kidneys from WT mice 24 hours post-IRI, a phenomenon partially lost in their IL-33–deficient counterparts (Supplemental Figure 10). The key role of IL-33 in mediating iNKT cell activation and recruitment in renal IRI is supported by the similar phenotype of iNKT cell–deficient Jα18KO and IL-33–deficient mice, namely complete protection against IRI (Figure 7A) together with decreased neutrophil (Figure 7B) and monocyte/macrophage (Figure 7C) infiltration. Note that the plasma levels and time course of IL-33 release into peripheral blood were not affected by iNKT cell deficiency in Jα18KO mice undergoing IRI (Figure 7D), a finding that highlights the requirement of iNKT cells as a mediator of IL-33 activity. Early release of IL-33 after IRI is not accompanied by severe neutrophil infiltration and renal dysfunction in mice lacking iNKT cells. WT and Jα18 knockout (iNKT cell–deficient) mice were subjected to sham surgery (Sham) or 32 minutes of unilateral ischemia after contralateral nephrectomy (Ctr). After 1, 3, 6, or 24 hours (T1, T3, T6, or T24, respectively) of reperfusion, kidneys and peripheral blood were obtained. (A) Plasma creatinine and (B) BUN levels T24 post-IRI. Note that we found no difference between Sham and Ctr creatinine and BUN values (data not shown), indicating the absence of a significant sham effect. Absolute numbers (per kidney) of (C) CD45(+) CD11bhigh F4/80low cells (monocytes/macrophages) and (D) CD45(+) GR-1high CD11bhigh cells (neutrophils) at T24 post-IRI. Data are expressed as means±SEM of four to six animals per group. *P<0.05; **P<0.01; ***P<0.001. (E) Plasma levels of IL-33 (picograms per milliliter) were significantly increased as soon as 1 hour after reperfusion in IRI-induced WT and iNKT cell-deficient mice, and compared with Sham mice. No differences were found between WT and iNKT cell–deficient mice. For each WT or iNKT cell–deficient group of mice, two-tailed Mann–Whitney U test was used for two group comparisons, and one-way ANOVA followed by Tukey post-test was used for three or more group comparisons. *P<0.05 versus T0; **P<0.01 versus T0; §P<0.05 versus Sham. The peak of the IL-33–dependent inflammatory response 24 hours after IRI induction was preceded by a very early phase (making up the first 6 hours of reperfusion) characterized by a slight but significant increase of creatinine/BUN levels and ATN scores (Supplemental Figure 11A) as well as myeloid cell infiltration (Figure 8, A and B). The fact that both tubular epithelial necrosis and alterations of kidney functions but neither myeloid cell recruitment (Figure 8, A and B) nor the increase in chemokines MCP-1/CCL2 and MIP-2/CXCL2 (Supplemental Figure 12) responsible for their recruitment to inflammatory sites41 were lost in 6 hours post-IRI in IL-33–deficient mice supports the notion that IL-33 initiates tissue lesions in an immune cell–independent fashion. This evidence corroborates our finding in vitro that IL-33 targets renal epithelial cells (Supplemental Figure 11B). 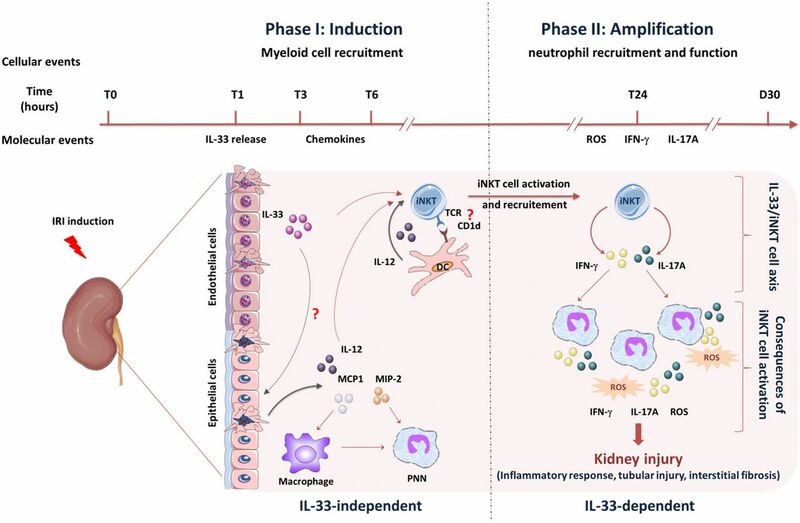 Moreover, this initial inflammatory episode preceded the recruitment of iNKT cells (Figure 8C), natural killer cells, and myeloid DCs (Supplemental Figure 13), which indicates that the IL-33/innate ST2–expressing cell axis amplifies rather than initiates monocyte/macrophage and neutrophil infiltration. Initiation phase of monocyte/macrophage and neutrophil infiltration induced by IRI does not require IL-33 and precedes iNKT cell recruitment. WT mice and IL-33Gt/Gt (IL-33–deficient) mice were subjected to 32 minutes of unilateral ischemia after contralateral nephrectomy (Ctr). After 3, 6, or 24 hours (T3, T6, or T24, respectively) of reperfusion, kidneys were obtained, and fresh leukocytes were isolated to examine the number of CD45(+) F4/80low CD11bhigh cells (monocytes/macrophages), CD45(+) GR-1high CD11bhigh cells (neutrophils), and CD45(+) PBS57-loaded CD1d TT(+) CD3(+) (iNKT) cells. Absolute numbers (per kidney) of (A) CD45(+) F4/80low CD11bhigh cells, (B) CD45(+) GR-1high CD11bhigh, and (C) CD45(+) PBS57-loaded CD1d TT(+) CD3(+). WT mice (left panels). IL-33–deficient mice (right panels). Data are expressed as the means±SEM of six animals per group for each time. Two-tailed Mann–Whitney U test was used to compare IRI groups with the Ctr group. *P<0.05; **P<0.01; ***P<0.001. Intriguingly, although IL-33 release reached its peak as soon as 1 hour post-IRI, its effect on myeloid cell recruitment occurred only 24 hours after IRI induction. A probable explanation is that IL-33 targets iNKT cells as a cofactor of T cell receptor (TCR) and/or IL-12 stimulation rather than an independent stimulus. Indeed, we noted a threefold increase of plasma IL-12, which reached its peak only 6 hours after ischemia-reperfusion (Figure 9A). Just like IL-12 release, it was reported that TCR-mediated activation of iNKT cells does not occur within the first hours after induction of IRI,31 whereas IL-33 dramatically enhances IFN-γ production by iNKT cells stimulated on TCR in combination with IL-1228–30 (Figure 9B). These data together with the fact that maximal increase of surface ST2 levels on iNKT cells was not achieved within the first hours after clamping (Figure 9C) may explain why an amplification effect of IL-33 on immune cells was manifested only 24 hours post-IRI. Increase of circulating IL-12 and surface ST2 overexpression on iNKT cells precede the IL-33-dependent phase of innate immune cell infiltration. WT and IL-33Gt/Gt (IL-33–deficient) mice were subjected to 32 minutes of unilateral ischemia (IRI) after contralateral nephrectomy. After 3, 6, or 24 hours (T3, T6, or T24, respectively) of reperfusion, peripheral blood was collected. (A) Increase of circulating IL-12 during IRI. Plasma levels (relative mean fluorescence intensity [MFI]) of IL-12p70 were significantly increased after IRI at 3 hours after reperfusion compared with untreated (T0) mice. Data represent the mean±SEM of five to six mice per group and time point. Two-tailed Mann–Whitney U test. (B) IL-33 acts as a cofactor of IL-12 to enhance IFN-γ production by iNKT cells. Freshly sorted splenic iNKT α-GC–loaded CD1d TT(+) CD5(+) cells (details are in ref. 29) from WT C57BL/6 mice were cultured for 48 hours on plates (25×103 per well) coated with or without anti-CD3 mAb and/or IL-12 (20 ng/ml) in the presence (hatched columns) or absence (white columns) of IL-33 (10 ng/ml). IFN-γ concentrations in the supernatants were quantified by ELISA. Data represent the mean±SEM of three independent experiments. Two-tailed Mann–Whitney U test was used for two group comparisons. (C) Increase of surface ST2 levels on WT C57BL/6 iNKT cells during IRI. Surface levels of ST2 (MFI) on PBS57-loaded CD1d TT(+) CD3(+) cells after gating on live CD45(+) cells were significantly increased after IRI at 3 and 6 hours after reperfusion compared with their untreated (T0) counterparts. Data represent the mean±SEM of three mice for each time point. Two-tailed Mann–Whitney U test. *P<0.05; **P<0.01. Figure 10 recapitulates the time sequence of IL-33–dependent and –independent immune events in kidney IRI. 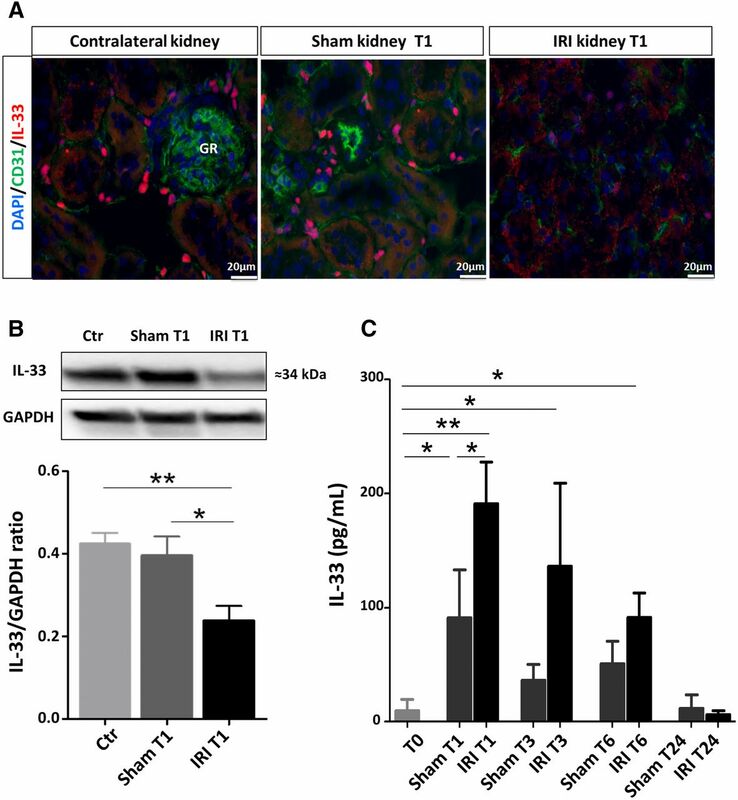 Endogenous IL-33 contributes to kidney ischemia-reperfusion injury as an alarmin by promoting ST2-expressing cell recruitment. IL-33 amplifies monocyte/macrophage and neutrophil infiltration by promoting iNKT cell recruitment. Within 3–6 hours post-IRI induction, monocyte/macrophage and neutrophil kidney infiltration occurs (details are in Figure 8). Despite the concomitant IL-33 release by injured microvascular endothelial cells, this early phase of innate inflammatory response is IL-33 independent (left side) and may result from chemokine release and action (details are in Supplemental Figure 12). We postulate that, in this early phase, the production of proinflammatory mediators (cytokines and chemokines) by damaged kidney cells and resident immune cells is sufficient to initiate the recruitment of neutrophils and monocytes/macrophages. Within 6–24 hours post-IRI induction, iNKT cell recruitment and activation occur in an IL-33–dependent (right side) manner. Mechanistically, this phenomenon could involve IL-1247,49–51 and CD1d-dependent presentation of self-ligands31 by myeloid DC, of which of the recruitment depends on IL-33. 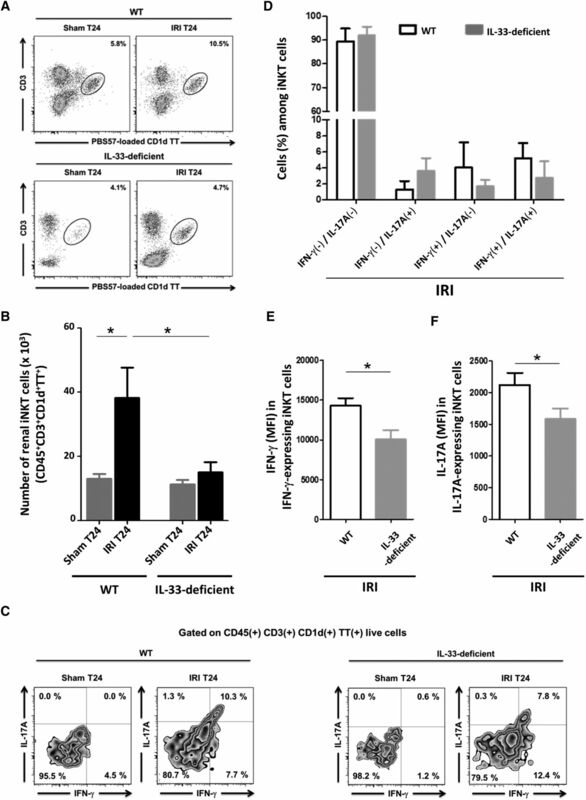 We postulate that TCR engagement and IL-12 do not provide sufficient stimulation during IRI for effective activation and recruitment of iNKT cells and that IL-33 acts as a requisite coplayer leading to complete activation and recruitment of these cells. During this late phase, IFN-γ/IL-17A–expressing iNKT cells amplify monocyte/macrophage and neutrophil recruitment and promote their proinflammatory cytokine production. Despite discordant results in earlier studies, it is now generally accepted that neutrophils play a direct and deleterious role in kidney IRI,44–46 supporting the view that their IL-33/iNKT cell–dependent recruitment results in severe acute tubular injury and ultimately, interstitial fibrosis. Lastly, IL-33, other than its immune-dependent actions, can also target proximal tubule epithelial cells to produce inflammatory mediators. PNN, polynuclear neutrophil. We show here for the first time that endogenous IL-33, released from endothelial cells as alarmin, contributes to the pathogenesis of IRI-induced kidney injury by targeting both immune and nonimmune cells (Figure 10). Without IL-33, clinical and histologic hallmarks of acute ischemic renal failure were attenuated, with less severe tubulointerstitial injury and preserved renal function. IL-33 is mainly and constitutively expressed in the nuclei of epithelial barrier tissues and endothelial cells, and it can, therefore, be immediately released in response to cell injury. The few studies on the cellular localization of IL-33 in the kidney have documented a constitutive expression in endothelial nuclei of renal large and small vessels in humans42 and also, peritubular vascular endothelial cells with a similar expression profile21,23 in mice. In agreement with these data, we show here that, in healthy murine kidneys, IL-33 is mainly expressed by CD31(+) CD45(−) endothelial cells in peritubular capillaries and CD31(−) CD45(−) interstitial cells, which may be pericytes, endothelial progenitor cells, and/or fibroblasts. The initial event triggering tissue injury after kidney ischemia-reperfusion is acute reduction of blood flow followed by endothelial cell necrosis. We found that full-length active IL-33 disappeared from renal endothelial cells and increased in circulation within only 1 hour of reperfusion, with no change in Il-33 mRNA expression. This result proves that, in this situation, IL-33 can signal damage as an alarmin after released from the nucleus of dying endothelial cells. As an immediate result, IL-33 initiates renal lesions in an immune cell–independent fashion, presumably by direct targeting of tubular epithelial cells. These data, although it remains to be determined whether IL-33 has cytotoxic activity on renal proximal tubule epithelial cells, are consistent with the view of Molitoris and Sutton43 that endothelial injury is the initial event in renal IRI. In addition, IL-33 further amplifies tissue injury, especially involving neutrophils, via its effect on iNKT lymphocytes, which have deleterious action during kidney IRI that is widely recognized. Indeed, after ischemia-reperfusion, neutrophils are recruited to the kidney, where they act as major IRI effector cells.44–46 It is widely acknowledged that their recruitment and activation depend on iNKT cells, presumably via their IFN-γ/IL-17A production.31,32 We provide three lines of evidence that IL-33 and iNKT cells interact directly to promote neutrophil infiltration in ischemic kidneys. (1) iNKT cells constitutively express the IL-33 receptor–specific ST2 chain.29,30 (2) IL-33 drives recruitment of iNKT cells and induces their IFN-γ/IL-17A production in response to ischemia-reperfusion. (3) IL-33, iNKT cells, and IFN-γ/IL-17A production is interconnected, because recombinant IL-33 targets iNKT cells in vitro to induce the proinflammatory cytokines that mediate IRI. Like iNKT cells, neutrophils express ST2 and could, therefore, respond directly to IL-33. However, the failure to recruit neutrophils in mice lacking iNKT cells does not support this assumption. At steady state29 and in pathophysiologic settings,37 IL-33 seems to behave like a cofactor of IL-12 and/or TCR stimulation rather than as an independent stimulus by targeting iNKT cells. Consistent with a similar scenario during IRI (Figure 10), we noted an increase of plasma IL-12, whereas Marques et al.47 reported protection of IL-12–deficient mice. Moreover, recruitment/activation of iNKT cells during IRI is mediated through interactions with CD1d,31,32 implying that endogenous Ags, presumably self-glycolipids associated with CD1d molecules and recognized by the invariant TCR, are involved.48 These lines of evidence together with our demonstration that myeloid DC recruitment during IRI depends on IL-33 raise the possibility that the DC compartment concomitantly releases IL-12 and presents iNKT cell ligands during IRI, as reported in response to stress conditions48–51 (Figure 10). Together with our evidence for a direct interaction of IL-33 with iNKT cells to regulate noninfectious inflammation in the lung,37 our study supports the notion that the IL-33/iNKT cell axis represents a new general physiopathologic mechanism involved in sterile inflammation associated with tissue damage. It may also apply to IRI occurring during human renal transplantation as suggested by our recent pilot study, which indicates that prompt release of lL-33 into the circulation could be responsible for the early activation of iNKT lymphocytes.28 This study and another recent study27 raise the question of whether IL-33 released into the blood could be an early AKI biomarker in humans. Our study improves understanding of the role of IL-33 as an alarmin during kidney ischemia-reperfusion, especially the underlying mechanisms of its implication in the dynamic between renal endothelial and epithelial cells. Moreover, the alarmin signaling pathway may become instrumental as a new therapeutic target through which the innate inflammatory cascade involved in IRI and AKI could be neutralized. This approach would be beneficial for long-term graft survival, which represents a major challenge in transplantation. WT C57BL/6 mice were purchased from Janvier Labs (Le Genest-Saint-Isle, France). IL-33–deficient C57BL/6 mice with a Lac-z Gt reporter (IL-33Gt/Gt) were generated as described by Pichery et al.52 Jα18KO C57BL/6 mice (lacking iNKT cells) and ST2KO C57BL/6 mice were provided by Taniguchi and colleagues53 and McKenzie and colleagues,54 respectively. All mice were maintained in our animal facilities under specific pathogen-free conditions; 10- to 12-week-old male mice weighing between 25 and 30 g were used in all experiments. Animal care and manipulations for experimentation were conducted in accordance with the guidelines of the French Agriculture and Forestry Ministry (decree 87849) and the European Communities Council Directive (86/609/EEC), and they were approved by the local ethics committee (COMETHEA: CE2012–06). An established mouse model of unilateral renal ischemia-reperfusion was used (Supplemental Figure 2). Briefly, mice were anesthetized with isoflurane (2% for induction and 1.5% for maintenance). After flank incision, the right renal pedicle was clamped using a straight Schwartz Micro clip (Fine Science Tools, Heidelberg, Germany) for 32 minutes and then released. This duration of ischemia was chosen to induce kidney injury of notable severity without a high mortality rate, permitting evaluation of the fibrosis process after functional recovery. The left contralateral kidney was ligated and removed before IRI induction, and it was used as a healthy and internal control for comparison with the IRI and sham kidneys. Sham-operated mice underwent identical surgical procedures without clamping of the renal pedicle and served as controls for IRI mice. Body temperature was controlled throughout the procedure. Animals were then allowed to recover, with free access to food and water. Blood was collected from retro-orbital sinus of isoflurane-anesthetized mice, and right kidneys were removed after 1, 3, 6, or 24 hours of reperfusion. Plasma creatinine and BUN were measured 1, 3, 6, or 24 hours after reperfusion to assess renal function using high-performance liquid chromatography as reported55 and the Cobas C701 automatic analyzer (Roche Diagnostic), respectively. Mouse IL-33 (Quantikine kit), mouse MCP-1 (Quantikine kit), mouse IL-17A (Duotest), and human IL-8 (Duotest) were quantified in plasma by sandwich ELISA (R&D Systems) according to the manufacturer’s instructions. Mouse IFN-γ was quantified by standard sandwich ELISA as previously described.29 Luminex technology was used according to the manufacturer’s instructions to measure mouse IL-12p70, MIP-2, CCL5/RANTES, CXCL9/MIG, and CXCL10 in plasma (R&D Systems). Kidneys were fixed in 4% formol, embedded in paraffin wax, and sectioned at 3.5 μm. Periodic acid–Schiff staining was used to assess tubular injury. Histologic changes were evaluated by assessment of tubules that displayed dilation, cell necrosis and cast formation, and loss of brush border in addition to interstitial edema and interstitial inflammation. All histologic examinations were performed by a renal pathologist (J.-M. Goujon) in a blinded fashion using a semiquantitative scale as follows: zero (no damage), one (damage affecting <25% of the whole-kidney sections), two (damage affecting 25%–50% of kidney sections), and three (damage affecting 50% or more of the whole-kidney section). A polyclonal goat anti-mouse IL-33 antibody (R&D Systems; clone AF3626) that recognizes mouse full-length (34–37 kD) and cleaved (19–22 kD) IL-33 was used for immunostaining and Western blot analysis. For immunofluorescence studies, 5-μm cryosections were fixed 1 hour at 4°C in 4% paraformaldehyde. Sections were blocked and permeabilized with 3% BSA and 0.3% Triton X-100, and then, they were stained with primary antibody overnight at 4°C as follows: goat anti-mouse IL-33 (1:500), rat anti-mouse CD31 (1:500; clone MEC13.3; BD Biosciences), and APC-conjugated anti-CD45 (1:200; clone 30-F11; BD Biosciences). Slides were incubated for 1 hour at room temperature with secondary antibodies as follows: Alexa Fluor 488 donkey anti-rat IgG (1:250; A21208; Life Technologies) and Alexa Fluor 568 donkey anti-goat IgG (1:500; A11057; Life Technologies) were used as secondary antibodies. Nuclear staining was performed with 4,6-diamidino-2-phenylindole (Southern Biotech). For IL-33 detection by immunohistochemistry, 5-μm cryosections were fixed in acetone and immersed in peroxidase block solution (Dako) to eliminate endogenous peroxidase activity. The sections were incubated with 1% FBS and then goat anti-mouse IL-33 antibody (1:200) for 4 hours at room temperature. After incubation with the HRP-conjugated rabbit anti-goat IgG secondary antibody (1:200; Invitrogen), the immune complexes were visualized using DAB substrate (Dako). Images were obtained by fluorescence (Olympus BX41) or confocal (Olympus FV1000) microscopy using the same laser power and gain intensity for all pictures. IL-33 expression was digitally quantified using Visilog 7.1 software. For each animal, five fields were analyzed. For immunoblotting, kidney homogenates were lysed in RIPA lysis buffer (20 mM Tris-HCl [pH 7.5], 150 mM NaCl, 1 mM Na2EDTA, 1 mM EGTA, 1% Nonidet P-40, and 1% sodium deoxycholate) supplemented with phosphatase and protease inhibitor cocktail (Santa Cruz). The supernatants were collected after centrifugation at 14,000×g for 10 minutes at 4°C. Kidney lysates were resolved on SDS-PAGE, and nitrocellulose membranes were blocked with nonfat dry milk and incubated overnight at 4°C with goat anti-mouse IL-33 antibody (1:500) and then an HRP-conjugated rabbit anti-goat polyclonal antibody (1:2000; Invitrogen). The immunoreactive proteins were visualized with ECL Prime Western blotting detection reagent (Amersham) using the ChemiDoc MP imaging system (Bio-Rad). Relative protein levels were normalized to glyceraldehyde-3-phosphate dehydrogenase as a loading control (1:2000; Cell Signaling). Cryoconserved kidney sections (5 μm) were fixed for 10 minutes in cold acetone and then stained with Sirius red (Diapath) for 30 minutes at room temperature. Sections were washed in acidified water and ethanol (95% and then 100%), and then, they were mounted for light macroscopy analysis. The amount of collagen deposition (red area) normalized over the surface area analyzed was digitally quantified using Visilog 7.1 software. Total RNA was extracted from mouse renal tissue using the Nucleospin RNA extraction kit according to the manufacturer’s instructions (Macherey-Nagel). Total RNA (1 μg) from each sample was retrotranscribed into cDNA using the qScript cDNA Supermix (Quanta Biosciences). Quantitative real-time PCR was performed on the Rotor-Gene Q Lightcycler (Qiagen) using the 2× Perfecta SYBER Green Mix (Quanta Biosciences) and 500 nM specific primer for mouse Il-33: forward: CTACTGCATGAGACTCCGTTCTG and reverse: AGAATCCCGTGGATAGGCAGAG. Results were then normalized with Nono mRNA content: forward: AAAGCAGGCGAAGTTTTCATTC and reverse: ATTTCCGCTAGGGTTCGTGTT. Fresh kidneys were minced and passed through a 70-μm strainer (BD Falcon), and then, they were centrifuged at 300×g for 10 minutes in complete RPMI 1640 (Life Technologies). The cell pellet was resuspended in 36% Percoll solution (GE Healthcare) and then loaded on a layer of 72% Percoll solution followed by centrifugation at 500×g for 20 minutes at room temperature. Leukocytes were harvested from the interface layer of Percoll and washed in 1× PBS. Phenotypic analysis of renal leukocytes was performed by flow cytometry using the following mAbs: CD45-BV510 (clone: 30-F11; Biolegend), CD11b-PE (clone: M1/70; Biolegend), F4/80-FITC (clone: BM8; Biolegend), GR-1-BV421 (clone: RB6–8C5; Biolegend), NK1.1-APC (clone: PK136; Biolegend), NK1.1-PerCpCy5.5 (clone: PK136; BD Biosciences), CD3-PerCpCy5.5 (clone: 17A2; Biolegend), and ST2-APC (clone: 245707; R&D Systems). To identify iNKT cells, samples were stained with the α-galactosylceramide analog PBS57 loaded with mouse CD1d tetramer (TT) conjugated to BV421 or its unloaded tetramer used as a control (Supplemental Figure 7). For intracellular cytokine staining, cells were isolated and incubated for 4–6 hours in the presence of Brefeldin A (Golgistop; BD Biosciences). After staining with surface marker antibodies, cells were permeabilized with the Fix/Perm buffer (BD Biosciences) and incubated with anti-mouse IFN-γ–PE-Cy7 (clone: XMG102; BD Biosciences) and anti-mouse IL-17A–PE (clone: TC11–18H10; BD Biosciences) antibodies. Cells were analyzed using BD FACS Verse cytometer (BD Biosciences) and FlowJo v7 software (TreeStar, Inc.). Dead cells were excluded using the Live/Dead Fixable Near-IR Dead Cell Stain Kit (Life Technologies). iNKT [PBS57-loaded TT(+) CD5(+)] cells were sorted by FACS as previously described.29 Before sorting, freshly isolated splenocytes were enriched for iNKT cells by magnetic depletion of CD8, CD11b, CD62L, and CD19 cells (Invitrogen; Life Technology) according to the manufacturer’s instructions. Sorted cells were routinely 97% pure. A total of 2.5×104 sorted iNKT cells were cultured for 48 hours in 200 μg/ml complete RPMI with or without coated anti-CD3 mAb (1 μg/ml; BD Pharmingen) in the presence or absence of murine IL-33 (10 ng/ml; R&D Systems) and/or murine IL-12 (20 ng/ml; R&D Systems) in round-bottomed 96-well plates at 37°C and 5% CO2. IFN-γ and IL-17A were measured in supernatants by ELISA. Immortalized mouse kidney proximal tubule epithelial (TKPTS) cells were provided by Elsa Bello-Reuss and sent by Rafia Al-Lamki (laboratory of Dr. John Bradley, Cambridge, United Kingdom). The human renal proximal tubule epithelial cell lines HRPTEC and HK-2 derived from normal kidney were purchased from ATCC and provided by Dr. Michel Tauc (Sofia-Antipolis University, Nice, France), respectively. Cells were cultured in phenol red–free DMEM/F12 supplemented with 4% (HRPTEC), 5% (TKPTS), or 10% (HK-2) FBS in a humidified atmosphere of 5% CO2 at 37°C. The culture medium was refreshed every 2 days until cell confluence reached 70%–80%, and cells were further incubated for 24 or 48 hours in the presence or absence of the appropriate murine or human recombinant IL-33 (R&D Systems; 10–20 ng/ml). IL-8 and MCP-1 were measured in supernatants by ELISA. CellROX Green Reagent (ThermoFisher Scientific) was used to evaluate kidney superoxide production reflecting oxidative stress. Kidney cryoconserved sections (5 μm) were incubated at 37°C for 30 minutes in the dark with 5 μM CellROX Green Reagent. Samples were then washed with 1× PBS, mounted with media containing 4,6-diamidino-2-phenylindole (Southern Biotech), and observed using the Olympus BX41 fluorescence microscope system. Oxidative stress was determined and calculated using ImageJ. Data were expressed in arbitrary units as percentage of Σ mean of positively stained cells (green signal)/Σ mean of nucleus (blue signal). For each animal, five to seven fields were analyzed. Statistical analyses were performed using GraphPad Prism software, version 5.0. All of the experimental groups were compared using the nonparametric Mann–Whitney U test to calculate P values of two groups and one-way ANOVA for three or more groups followed by Tukey post-test. For survival analysis, the Kaplan–Meier plot with a log rank test was used. P<0.05 was considered to be statistically significant. Data are shown as mean values ±SEM. The authors are especially indebted to E. Schneider for critically reviewing the manuscript, the English of which was reviewed by Jeffrey Arsham, an American medical translator. HK-2 cells were kindly provided by Dr. Michel Tauc. We thank Dr. Anne Cantereau and Dr. Alice Barbarin for technical assistance with confocal microscopy, Dr. Adriana Delwail for flow cytometry (ImageUP Platform, University of Poitiers), Sandrine Joffrion for biochemistry measurements (Centre Hospitalier Universitaire of Poitiers), the Anatomopathology Department of the CHU of Poitiers, and especially, Julie Godet, Sihem Kaaki, and Alexia Rinsand. Nathalie Piccirelli and Dr. Clara Steichen provided assistance with TKPTS cells and primary renal proximal tubule epithelial cell cultures, respectively. We also thank Dr. Mohammed Sehnine, Dr. Mebarka Haroun, and Benjamin Morin for their technical assistance. The authors gratefully acknowledge the National Institutes of Health Tetramer Core Facility for providing the CD1d tetramers. The study was supported by the Poitou-Charentes Region, Institut National de la Santé et de la Recherche Médicale, CHU of Poitiers, the University of Poitiers, the Association pour la Recherche en Immunologie Poitou-Charentes, and Octapharma. A.H. and A.T. contributed equally to this work.